How long has it been since you paid yourself… well? 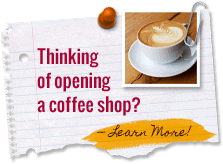 Established in 1991, Crimson Cup Coffee & Tea roasts and packages quality, great-tasting coffee in Columbus, Ohio while providing independent business owners with coffee shop consulting. We’ll show you how to keep your businesses successful over the long term. Crimson Cup caters to independent coffeehouses in communities of less than 50,000, and currently works with about 400 businesses, most of them east of the Rockies. We provide coffee business consulting that takes a frank, honest look at your business, analyzes operations, and then provide suggestions, training, and strategies. You’ll make more money per sale, gain new customers and hire fewer employees. We’re more than a provider of coffee shop supplies. Simply put, we know where the money is and how to help you get it. Q. What’s this gonna cost me? We believe in small business. We want you to succeed. And we want coffee lovers to know there’s tastier coffee at your shop than what’s available in the big chains. We think coffee business consulting is a two-way street. The idea is not for you to pay us for our advice. The idea is for us to provide extra value so that we’re both successful. Since we invest in your business for several weeks without charging a dime, we like you to use our products and coffee shop equipment. Q. Ah ha! So that’s where you’re making the big bucks, huh? Uh, no. Of course, we want to make a fair wage, just like you do, however our coffee products are very competitive. We enjoy coffee business consulting because of the personal interaction and the positive aspects of mutual success, but we’re much more than a restaurant coffee shop supplier. Q. But I like my coffee products already and my customers won’t like a change. We understand. You’ve taken a great deal of care in choosing your products. And we love happy consumers too. But as your coffee shop consultant, we’d like to suggest you taste our products before you decide. Crimson Cup coffee is incredibly great. We use only the best beans grown worldwide. Our coffee has been masterfully roasted and blended in much the same way that a gourmet chef creates a meal to remember. In fact, it often wins blind taste tests against big competitors. Q. My sales will go down. We can certainly see why that would worry you. But (no offense), how do you know for sure? Our experience in coffee shop consulting and past clients would suggest otherwise. Let’s get together. You can always walk away. Q. What guarantee do I have that your system will work? Here’s what we will tell you. If you follow our system, you will increase your bottom line. This has been documented in our work as coffee shop consultants in case-after-case. Just take a look at some of the testimonial videos on this site. But it only works if you’re available to listen with an open mind.